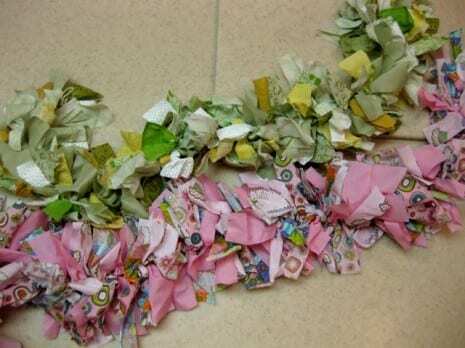 I saw a photo of this rag garland Jennifer W made for her daughter Riley's 1st Birthday and I thought it was so adorable, I had to ask how she make it. She put together this easy tutorial for us, so a big thank you to you, Jennifer! When planning my daughter Riley's first birthday party I wanted a unique banner or garland to hang on our fireplace. I saw these rag garlands used in holiday decor on various blogs and decided to try my hand at making one. I used them on the mantle, on the high chair and over the punch bowl. If you love them as much as I do, here's how to make your own. First decide where you will hang your garland and how long it will need to be. 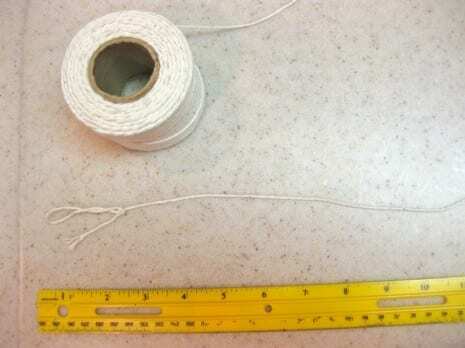 Measure out a piece of twine in that length. I add a few inches to each end and add a knot for hanging. Next choose your fabric. 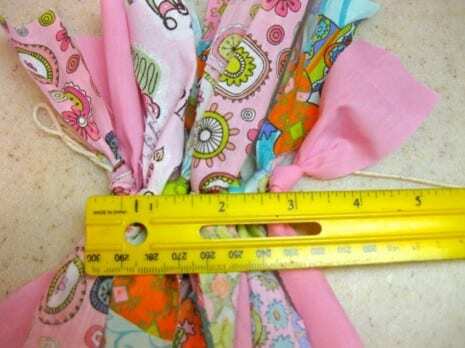 This is a great project to use up your fabric "stash." You could also incorporate ribbon into your garland. 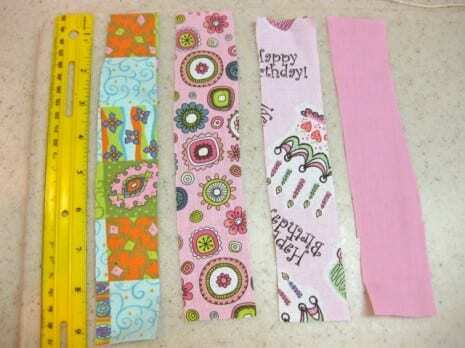 For my cupcake party garland I cut my fabric into 9x2 inch strips but you could vary this depending upon the look you want. 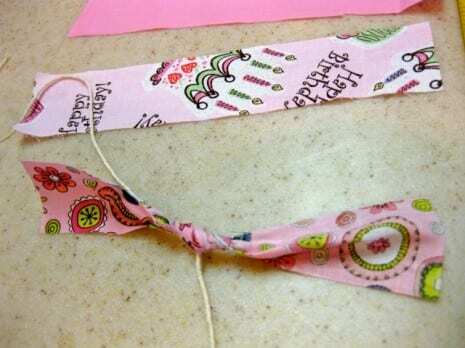 Now begin tying your fabric strips onto your twine. Just a single knot, pulled tight. 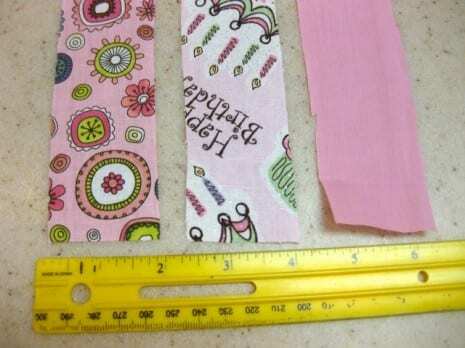 As you tie, push the strips to one end of the garland. Personally I prefer a random look but you could also add strips in a pattern. Note: For this project it took 10 strips to complete 3 inches of garland. 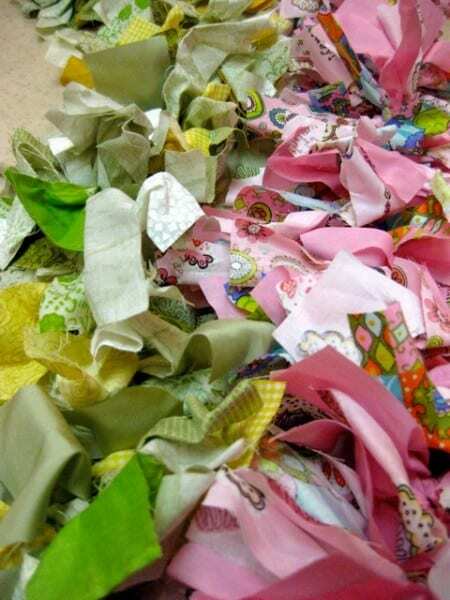 These rag garland are a fun and inexpensive addition to any party or holiday decor. Jennifer, thank you again! I love how "shabby chic" they are, which, if you read my blog, is one of my favorite party styles. Check out the rest of the cute "cupcake" party Jennifer threw for her daughter, Riley. The cupcakes are beautiful and the personalized Jones sodas are a nice touch, too. Also, if you make a rag garland of your own, please send photos so I can post them. Thanks for the tutorial. 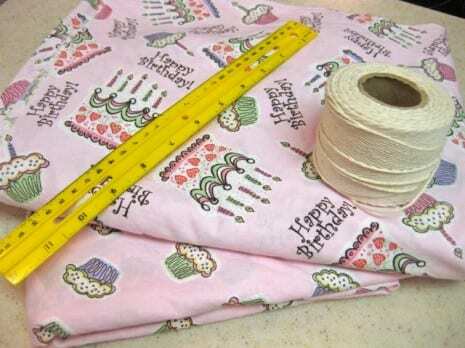 I'll be making these for my daughter's sewing party. I've been making these for about ten years now, and did a tut on them on my blog over the winter. It's one of my fave projects! 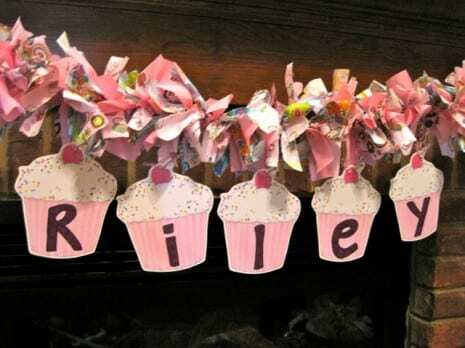 Where did you get the cupcake cutouts for Rileys name?